Rob Hooper (right) was in banking for approximately 12 years Rob has been involved in all facets of the real estate industry for over 25 years and an owner/principal for most of those. Rob is an Associate of the Real Estate Institute of New Zealand AREINZ and gained his Diploma in Real Estate Studies from Massey University in 1995. Having lived in the BOP all his life Rob has an extensive overall knowledge of the region and has seen many changes and trends over his time. Cameron Hooper (left) is a true Local Real Estate Specialist. Having started studying towards a Business Management Diploma in 2002 before embarking in the construction industry with his own building company, then in 2008 he moved into Real Estate at the start of the GFC, his construction background has been invaluable within the property industry. Having covered every aspect of the modern Real Estate office through Sales, Property Management, Sales Management and now overseeing the day to day operations of the six branches. Cameron is proud to be part of the First National brand. 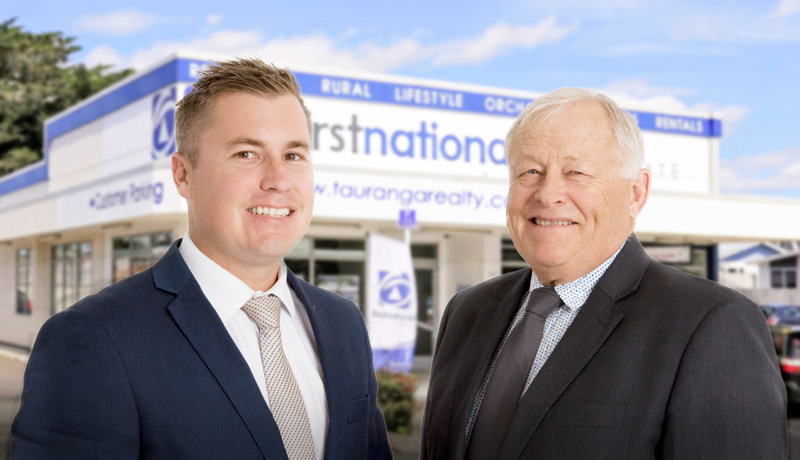 He has been building a reputation over the past years and is now becoming known for being extremely knowledgeable with the current local market trends, pricing structures and values right here in Tauranga. Family owned and operated Real Estate Company with six offices covering the Tauranga/Bay of Plenty. In these offices you will find a team of positive, professional and dedicated sales staff delivering their very best for you, should you be either buying or selling. The offices are strategically located helping enhance your properties exposure to the market. Initially opened in 1991, Bethlehem First National Real Estate was the first and only real estate company in Bethlehem for over ten years. Having served in this area for that length of time we have built up a truly extensive knowledge of Bethlehem, Te Puna and Omokoroa and the greater part of Tauranga in residential, lifestyle and rural disciplines. Having sold many properties locally and some several times over - often to repeat clients. Our reputation is a huge part of our business and we appreciate all the local support. Second was the Welcome Bay office. This is the only Real Estate Company with an office in the Welcome Bay area providing detailed knowledge and delivering again great profile. Then came the Katikati office that is serviced by locals with a strong affinity with the area, covering residential properties, rural, orchards, and lifestyles. Te Puke, Pukehina and Papamoa offices are operating at a high level with the Te Puke office being the market leader in the town for many years. The location of all offices form a link across Tauranga from Katikati in the north to Pukehina Beach in the south. From a business point of view that provides a network for our salespeople and sellers when achieving their sales and successes. Town & Country Rentals is our Property Management division with a substantial portfolio. Town & County Rentals, has arguably one of the largest rental portfolios in Tauranga. Our managers are all trained in the latest technology available in the market place today. We have been successful in maintaining our profile for many years as a highly respected and very successful real estate company and we strive every day to enhance that reputation.